Nobody would intentionally sabotage their own business – unless you’re starring in one of those twisted drama thrillers made for the movies. For the rest of us without a future career in Hollywood, investing time, money and effort into a new business venture is just that – an investment. You’ve poured so much of yourself into your company or business model, why would you ever start chipping away at what you’ve built? No business is perfect, of course, but striving for perfection is one of the foundations of a growing, thriving enterprise, especially in the fast paced world of internet commerce. If you’re doing any of the following, you’re not only failing to thrive, but you’re also throwing a burning match onto all of your hard work. Your website is your calling card on the internet. It’s the first thing that people see when they look for your company, or, if you’re properly optimizing your site, it might be the first thing they see when they are looking for answers in an entire industry. If you’ve only put a partial effort into your site content and website design, you’re turning off your potential customers. Imagine pulling up a website for something like a dentist in your local area. If the website looks like something your teenage son designed for his intermediate school computer class, are you even remotely interested in what the site says? Those misspelled words and ugly graphics are enough to make you click away. Even if you invested heavily five years ago on your website – have you checked it out lately? Don’t waste your time or anyone else’s by running a business without some sort of classy, attractive website. Broken links, poor image quality and a lack of accessibility for mobile devices are all deal breakers for a lot of visitors. It might be time for a serious upgrade. So you created the perfect website. It is a mastery of colors, fonts and graphics. Then you start publishing content. Your homepage, your “About Us” page, and your ongoing blog efforts are all there working for your company. Unless they are working against you, that is. Quality content on your website represents your brand, and presumably you’re trying to offer interesting, engaging things that truly benefits your audience. If that’s the case, why do you keep posting simple-minded paragraphs that offer nothing of value to anyone? Odd phrases, poor word choices and terrible grammar are all big turn-offs for visitors – especially on a website or newsletter that is reaching out directly to customers. It makes your company look foolish. Invest in your content as much as you invested in your business plan and website. Otherwise it’s like putting cheap paint on a mansion – it’s never going to look like a million bucks. Search engine optimization takes very little effort on the most basic levels. Of course, the more developed your optimization efforts, the more work will be involved. Fortunately, there are teams of professionals who work with search engine optimization as well as ample ways to learn many of the basics yourself. every post and every page should be optimized. All of the content you’re using should be naturally optimized and should include helpful links for readers. In addition, your marketing efforts should not just include banner ads and phone book listings, but also some extra expense in local search engine optimization efforts at the very least. Either invest the time yourself or pay someone else to invest the time for you. When was the last time you had a really great idea? Did you act on it? Creativity is a gift, and if you still have a creative spirit, you should never stifle the urge to change something or improve efforts in a creative way. You likely built your business by seeing options outside of the norm. But are you still working creatively? Nothing in business lasts forever. As the preferences of your customers change, your own efforts will need to change as well. Use your creativity to stay ahead of the coming changes by innovating. Find new avenues to explore or new ways to explore your existing ones. If you haven’t flexed your creative muscle in a while, isn’t it time to do some mental stretching? When your business takes off, you’re going to need a lot of help, sometimes almost overnight. It’s natural to find others to take on some of the extra work for you, and outsourcing is an excellent way to scale your current operations, especially if it removes you from menial tasks and allows you more time to run the show. Be wary, however, of outsourcing too much too quickly. While it’s impossible to grow if you’re maxed out with detail work, it’s also impossible to remain successful if you’re not carefully following your delegates. Use organization techniques suitable to your business to stay in touch with your contractors and follow up frequently on status and effort. While many freelancers and workers will hit a deadline with excellent products every time, there are just as many who won’t without some oversight. Social media creates excellent opportunities for promotions and marketing. But it also creates tremendous opportunities to slack off or get overwhelmed. If you start fifteen social media accounts, you now have to manage fifteen accounts on a daily, sometimes hourly basis, to maximize those rewards. For many companies this simply isn’t possible, and those empty accounts make your company look bad. While social media can be outsourced to a certain extent, trying to run fifteen or twenty or even thirty accounts perfectly is a stretch for most small businesses. It is far better to open just two or three social media accounts that you can more easily manage. It is even better if you create those so that you can either automate a lot of your messages or delegate their responsibility to someone more specialized in that area. See How to Decide What Social Networks are Most Important to You based on your goals. There is a lot to be said about a quality product and a quality approach. But that doesn’t mean you need to reinvent the wheel every time you do anything in your business. One of the most basic rules of enterprise is to maximize efficiency where it makes financial sense to do so. This may mean outsourcing certain materials or perhaps buying materials in bulk. Always look for ways to make a job more efficient. If you’re paying someone to check numbers in a spreadsheet day after day – why not make that task automated and free up the employee to handle other, more complex tasks? Look for economies of scale and ways to chip away at waste in every stage and area of your business. A lean, efficient machine runs much better than a bloated, sluggish one. Being consistent means being steady which sounds great in theory. Unfortunately for those of you who crave stability, our world is changing too fast for you to be consistent for very long. If you’re trying your best to run your business now the way you did fifteen years ago, you’re in for some turbulence as the market continues to accelerate and adjust. Some parts of your business should be consistent – customer service, dedication to quality and customer experience, for example. But other parts including your core business model and marketing plans should be more fluid and adjust to the changing demographics, consumer preferences and marketplace. Equal treatment is getting a lot of press lately with the question of affirmative action up before the U.S. Supreme Court this summer. Most business owners and managers can already tell you some of what we’re likely to learn from the court. Being fair to everyone does not mean treating everyone exactly the same. Within your company you likely have employees willing to work hard and stay later to get a project done. You also have workers who cut out right at quitting time and seem to have as many “off” days as they do “on” ones. Do these workers deserve equal pay and equal mentoring? No! You’ll run off your top talent if you fail to reward their efforts above and beyond the norm. They are doing more, so they need more in return. Your more casual workers may complain a bit, but they usually understand that getting that extra bonus means doing extra work they just aren’t willing or able to do, so it works out in the end. Many small businesses started from a one-man operation. You used to be the only one or perhaps one of a few running things, which meant you did a bit of everything. Now, as your company grows, it’s time to take a few steps back and let other professionals take on certain tasks. If you keep your hand in every jar, trying to wrest control back the way you did years ago when you were fifty times smaller, you’re going to burn out, frustrate your employees and move too slowly to maximize possibilities in the marketplace. Learn to effectively manage. Choose professionals who can handle delegated tasks and position yourself to handle just the most important tasks for overseeing the production and growth of your business, even if letting go is hard to do. There is a fine line to walk between being innovative and brilliant and being so consumed by newness that you fail to gain traction in any particular task. Trying new things is well and good. In fact, it’s critically important. But don’t try new things at the expense of your core business model and profit centers. Your trials should have a purpose outside of just curiosity about the latest thing you read about in a blog or industry magazine. Do your research and make choices carefully. Then, when you do test a new product or idea, you’ll be choosing a good one, trying it in good faith and, if it’s effective, you can incorporate it into long term productivity for your company. 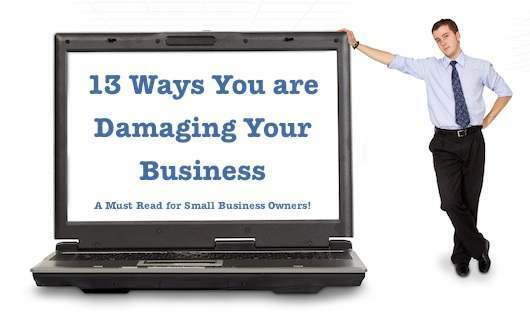 Small business owners tend to be everything to everyone, at least very early in their career. But small business owners also run a high risk of burning out if they overextend for too long a period of time. It’s natural to go all-in as an entrepreneur. It’s not natural or healthy to work eighteen-hour days for four years straight. being so pedal-to-the-metal every moment of the day. If you just can’t tear yourself away from the action, take in some dinners and sporting events with clients or other industry professionals and call it marketing. Don’t be the company who trails the others picking up the scraps of their innovation. While there is some profit in being the tail end of the industry, it’s an ultimately losing proposition. Stay on top of research and innovation in your industry, or even better, be that innovation. Being the first out of the gate, or at least in the first heat out of the gate, you’ll stand a far better competitive edge than those who read about your success later and try it out for themselves. It’s never too late to try something new, but if your “new” experiment is always another company’s “proven” method, you’re dragging behind the competition and it’s to your detriment.